Hello and thank you for reading my blog! If you are interested in finding out more about me and my psychic readings and healings you may also want to visit my related blog at http://www.sandiegopsychic.blogspot.com/. If you are interested in learning more about my work as a Wedding Officiant and/or you are planning a wedding or similar ceremony, please visit http://www.weddinginsandiego.blogspot.com/. Okay, so you may ask who and/or what is Wild and Tame Communications? My name is Sindi Somers and I am a professional psychic reader, energy healer and meditation teacher, among other things. I also love marketing, promotions, graphic design, visual and performing arts and writing. Pretty much every interest of mine involves communication in some way, so having the word Communications in my business title seemed fitting. A version of the banner above will be on the website I am creating. I don't have the main page Wild and Tame Communications banner done yet. The banner shown here will be on the page that announces my love of and experience in design and writing. As far as the Wild and Tame part; I love animals. We tend to use the adjectives of wild or tame when describing animals. If we want to attach these adjectives to people, I would like to suggest that we all have both wild AND tame attributes within ourselves. 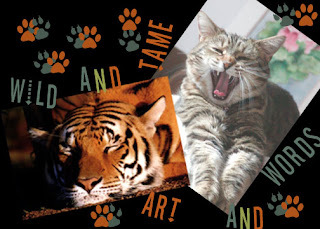 I thought the name Wild and Tame would be a fun business name and to me it is a way to communicate my love of animals and my deep passion for assisting animals in need. I enjoy assisting animals, people and the planet we all call home. Celebrate your wild side and enjoy your tame side. Wild and Tame - the new yin yang - creating balance in every aspect of ourselves and our lives. I can be contacted via email at wildandtame@gmail.com or by phone at 619-384-0761. Have a wild and/or tame day!